Our annual evaluations indicate that the Healthy NewsWorks program gives the participating student reporters more confidence and pride in their writing, as well as a thorough understanding of the health topics introduced. We have maintained an active qualitative and quantitative evaluation program since 2007 to help shape and inform our programming. We have presented our program to The College of Physicians, Section on Public Healthy and Preventive Medicine (2014), Pennsylvania Public Health Association (2011), and the American Public Health Association (2009). 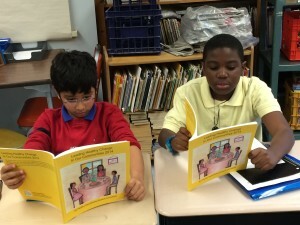 Healthy NewsWorks publications are a tool for reading enrichment. Students enjoy reading what their peers write and apply it personally. The program reinforces Pennsylvania literacy standards. In a systematic review of a sample of papers, an evaluator found that a typical edition issue addresses six of the eight National Health Education Standards. In pre/post-assessments of 70 students to capture program-specific knowledge over the 2015-16 school year, on average students were able to provide more correct, detailed answers on all five questions of the post-assessment versus the pre-assessment. Students improved especially on identifying how a website is trustworthy, providing examples of good sources, interviewing skills, and keeping teeth healthy. For more details, click here. In 2009, the Healthy NewsWorks program in Upper Darby was highlighted in the “Promising Practices” report, compiled by Project PA, a collaboration between the Pennsylvania Department of Education, Division of Food and Nutrition, and the Penn State University Department of Nutritional Sciences. These “Promising Practices” were submitted by Pennsylvania schools related to Coordinated School Health. Coordinated School Health is an initiative of the Centers for Disease Control and Prevention which includes eight components which work together to address students’ health needs and contribute to improvements in health and learning.